You may be wondering to yourself “whats with the big W”? (btw… can anyone name that movie…. the one where they all try to find the big W?). Well you see I decided to make a Washi Tape Craft to make some decor for my Sewing Room…. 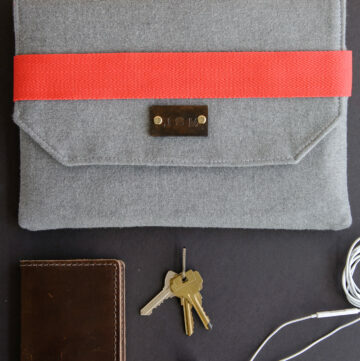 and W is the last letter in… sew! The kind folks at Scotch sent me a fun package of their new Expressions Tapes to play with! They have over 100 colors of Expressions Tapes in 4 types including Washi tapes, Masking tapes, Packing tape and Magic tape. 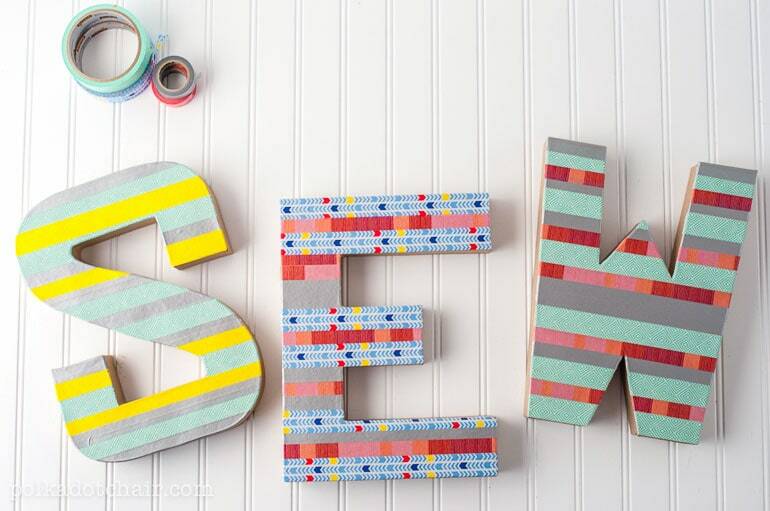 I decided to combine the great colors and prints from their tapes with some craft letters that I picked up at the store to make some wall art for my Sewing Room. I think that this project would also be a lot of fun for a kids room. Let me show you how to do it… it was soooo easy! No special tools required just some scissors. 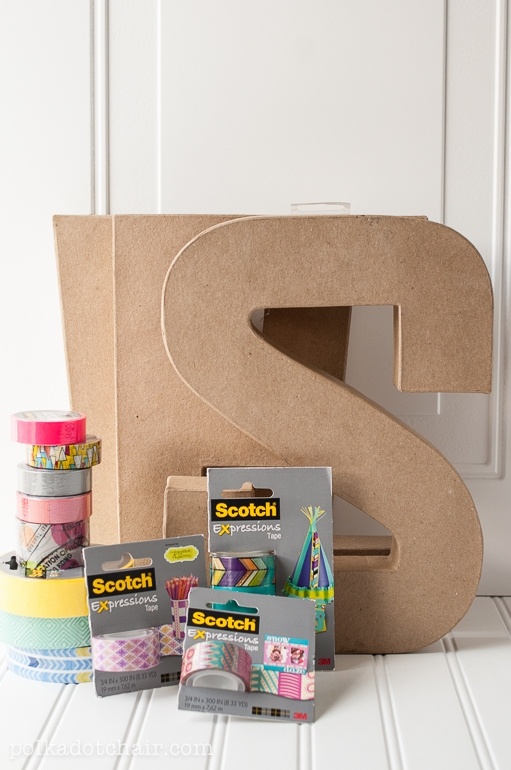 Start by covering the front of your letters with a combination of the tapes. I used both Washi tape and printed masking tape. Keep the tapes going straight across the letter even if there is a space in the middle. After you’ve covered the entire letter, trim down the tape with your scissors. I chose to leave the sides of my letters natural for pop, but you could easily paint them if you like. 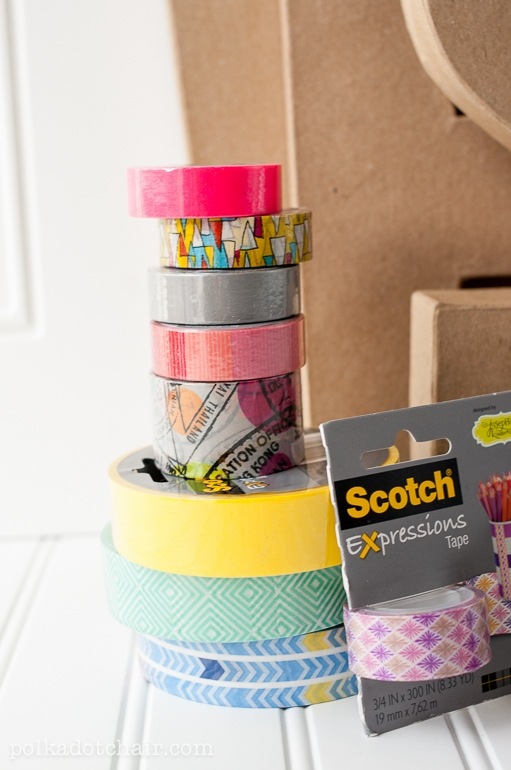 Would you like to play around with some Scotch Expressions tape yourself? Just leave a comment on this post and tell me what you’d make! You’ll be entered to win a jumbo prize pack of Washi tape! Enter until Midnight Eastern on October 14th. Full giveaway guidelines here. **Disclosure: I was provided with product by Scotch to create the crafts in this post. All opinions and ideas are 100% mine. The letters are such a good idea. I need to do one for my baby’s room! What a fun idea! I’d love to win! These look so good.. Would love to use the washi tape to decorate my 2 year old’s room. Thanks!! I was actually getting ready to do the letter with yarn but realized I didn’t have enough yarn..so washi tape it is..looks a lot easier too!! It’s a Mad, Mad, Mad, Mad World! One of my favorite comedies of all time! I’m supposed to have a plan for something before I bring it home? Interesting concept! LOVE! 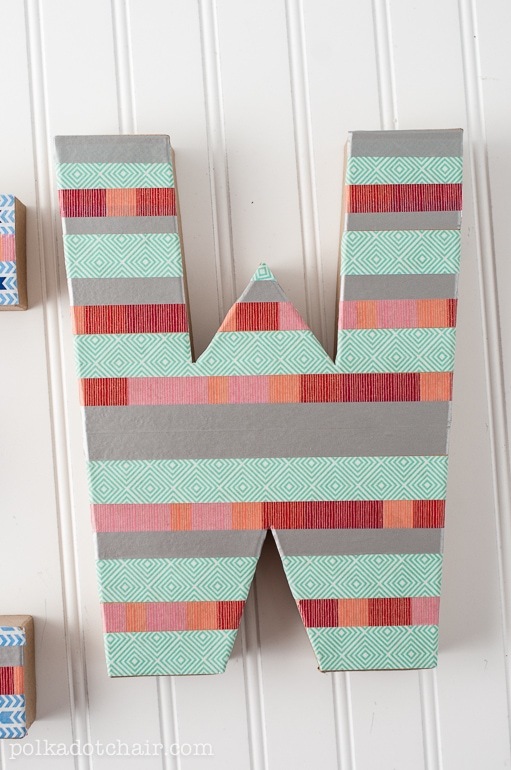 I’ve got some wooden letters in my craft stash…great idea! I would like to cover some picture frames with decorative tape. Congrats LeAnn you won! I’ll be in touch! Oh my girl scout troop would go WILD with this much washi! fun idea with the letters! my girls would LOVE this. thanks for the chance! That is “sew” cute. Now I want to make one for my sewing room. Thanks for the chance to win. I just purchased a small pkg of tape at Target to make birthday cards…you just put the tape on the card front…cut it…use glitter paint for the candle flame…done! I would go crazy! I would make these same letters (but a monogram of sorts) for everyone in my family so they could hang on their front doors (what a great Christmas gift!). I would also decorate my sewing room too! I’d make fun things for my granddaughter’s bedrooms. I have a cardboard shelf that was a display shelf in a store that I would love to make pretty with this tape! 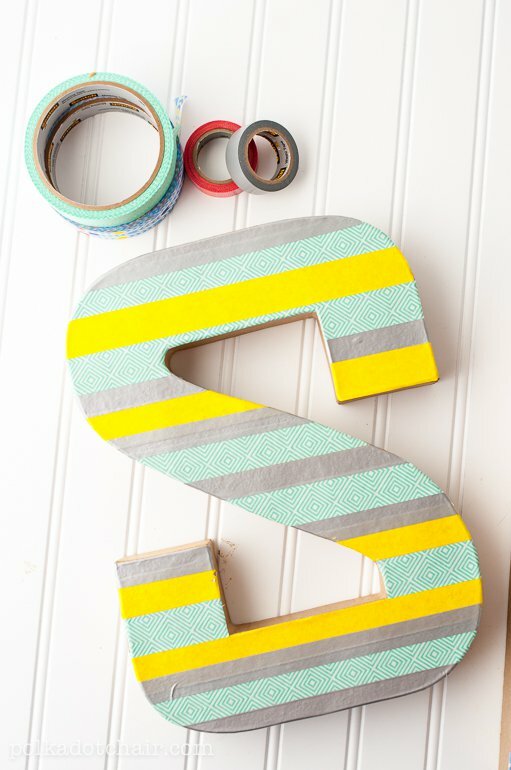 I want to make some letters for my sewing room just like you did — I love big letters and I love washi tapes! I think I’ll spell out “create” to help inspire me. wow!! they are amazing! I love washi tape, but i’m having a hard time finding it! would love to use it for letters!! great idea! I would love to win some washi tape. I would make some crafts with the kids with it. This looks like so much fun! 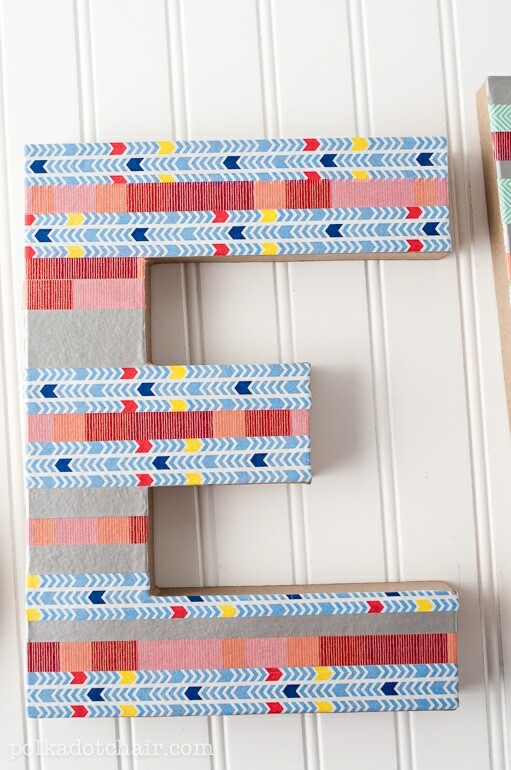 I would finally decorate letters to spell out my daughter’s name and hang them in her room. 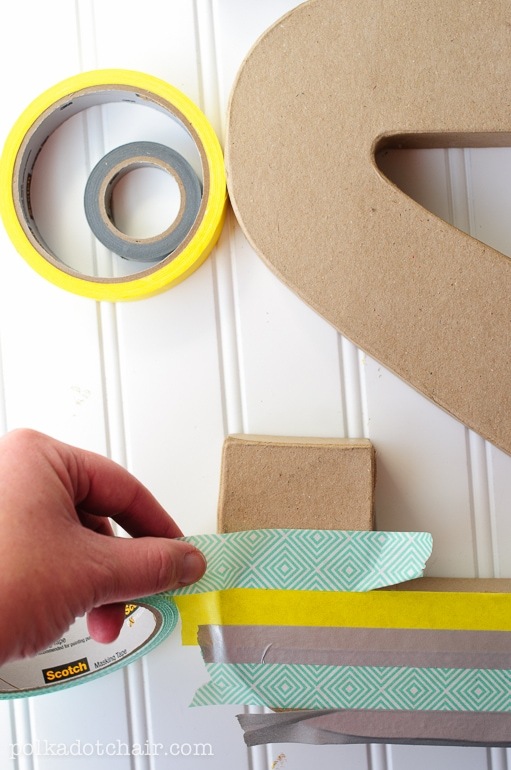 I also love the idea of using washi tape to decorate some picture frames. I’d love a chance to win! 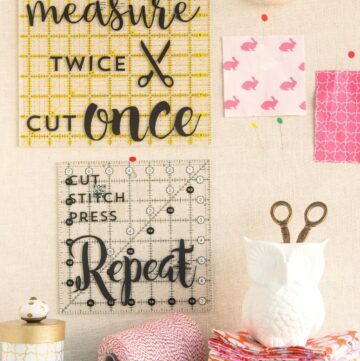 I’d use the washi tape to tape up stuff (like individual blocks) in my sewing room! I love your idea…..I would probably make my daughters name in a similar fashion as yourself! Thanks for offering! What a geat idea…I would probably do the same thing!! Ooh. I got a few rolls of this when I was shopping for school supplies. Not sure how it compares to traditional washi tape but I absolutely love it!! My daughters and I love to do crafts with washi tape! 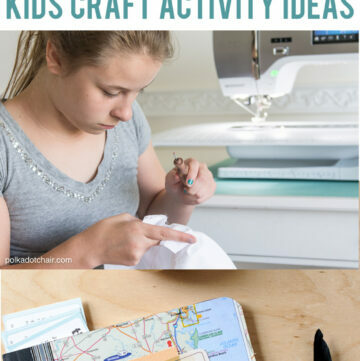 Oh my…what fun for the kids art projects! Charming! Love it! I would definitely use it!! I might dress up some of my sewing room marking pencils. And, I do like what you did with those letters! Thanks for the offer. I have never used washi tape before but have always thought it would be fun! I would use it for different crafts like decorating clipboards, light switch covers, bookmarks, pencils or clothespins. I would for sure use it on binder clips – they are so pretty with washi tape decorating them! I would also use it on disposable cups when we have the whole family over to mark everyone’s cup differently so they would know which one is theirs. The possibilities are endless…pinterest here I come! I would love to do one big H for our living room and a C for my sons room. i would love to make my daughter’s initials for her room!! I love using washi for gift wrapping. Love your letters, might have to do that also. I just made a chalkboard clipboard for my niece and daughter and would love to have some washi tape to cover the rest of the board. it would b so cute!!! That is so neat looking! I so LOVE this idea!! Would love to win so I can do this for my sewing studio!! Very cute! I think I would do exactly what you did with them! Or do my kids’ names. OR, I think it would be really cute also in my kitchen with the word EAT. Really refreshing colour schemes! I would make letters for my hobby room and I would like to make some for my entrance table for Thanksgiving and New Year’s Day. A Welcome would be nice on my post-Christmas wreath on the front door as well! Thanks! 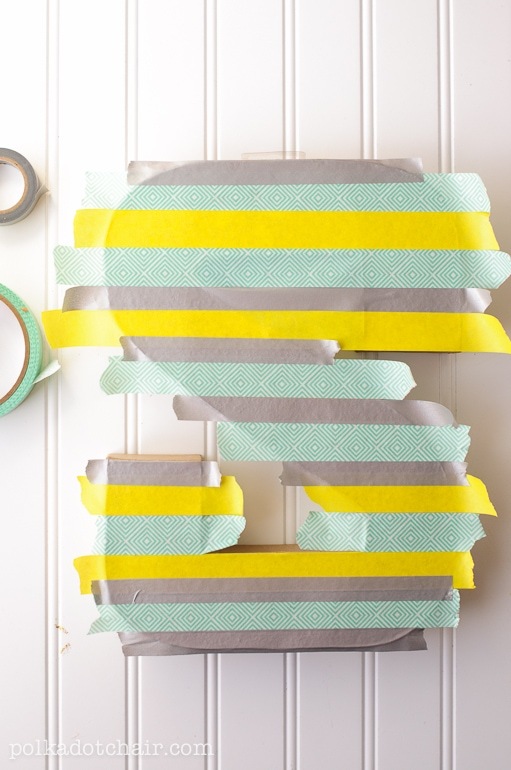 I love what you can do with decorative tape…. who knew? A picture frame, the front of a journal, oh I could have so much fun! Thanks for chance to win! I would love to do my granddaughters name for her bedroom. She will love it. My daughter teaches pre-K and I bet she could come up with several uses for the tape. Thanks for the giveaway. I would make big first-name initials for my 3 grandsons. I am going to make some letters for my daughter. She graduated college in May and will be getting an apartment in NYC soon. Thanks for the great idea and giveaway. It’s a mad mad mad mad mad mad world! remember watching that classic comedy when I was a kid. Gotta do my granddaughters name for her bedroom wall. Yep! Love that movie too! Used to watch it over and over again! I’d love to make these letters for my new grandson’s room. My five year old artist is getting a bunch of new art supplies for Christmas. We plan on using old jars to corral everything. Washi tape would make it all so much more her. It’s a Mad Mad Mad Mad World. One of the greatest casts of all time. I’ve had my evey on washi tape for some time now. Think I’ll plan a day with my granddaughters and make their names for their rooms. I LOVE these! I feel like I just hoard my washi tape. Now I actually have a project to use it on! Thanks for sharing! this would be great for all sorts of decorating! for the chance to win this great product!! Cute idea! I would use mine to cover a homemade scrapbook album! I would use mine to decorate the Grandkids’ playroom. I can’t wait to make these for our bedroom!! 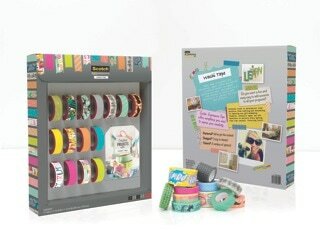 I would love to win this pack of Washi tape! I am going to be a Great Grandmother in about 5 months- and would love to decorate all the letters A to Z for the whole wall in the Nursery. It hasn’t been decorated yet and I think that would make a great look. I would LOVE to do names for all 11 of my grandkids!! Crazy, I Know, but; I Want To Cover Some Old Shoes. They Just Might Look Fabulous! I like using washi tape on clay pots, and cards. I can’t seem to find big rolls of Washi Tape anywhere. 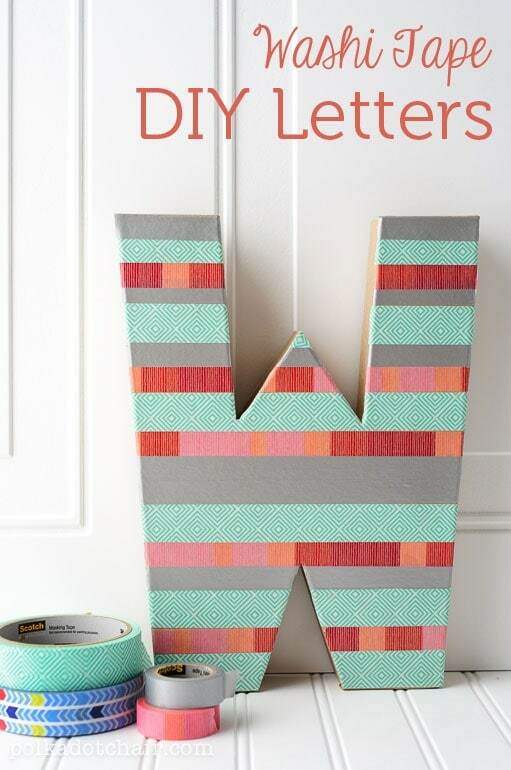 I would love to try and make the letters and vases with Washi tape. This very useful creativity for kids to learn, Thank you for sharing.